Mr Muscle total Spring Clean competition! 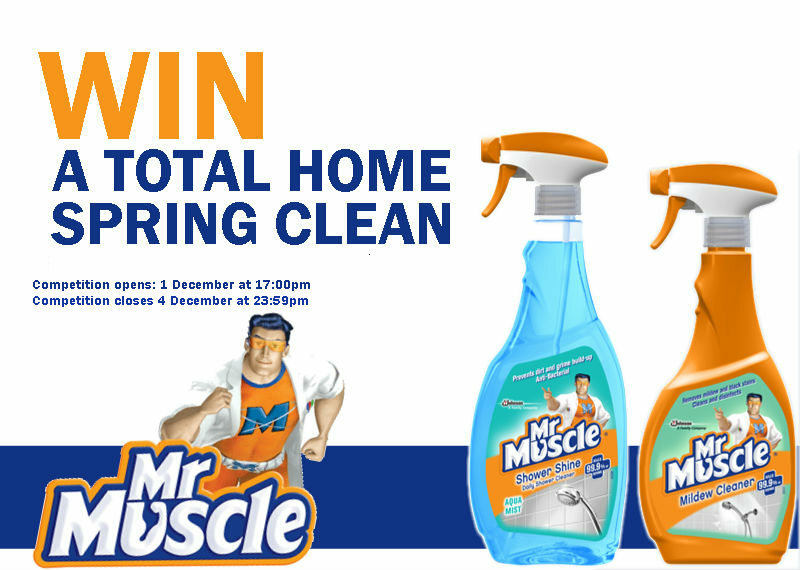 Stand a chance to win a Mr Muscle total Spring Clean competition! 2.1. Entries for the Competition will open at 17h00 on Thursday, 01 December 2016 and will close at 23h59 on Sunday, 04 December 2016 (Competition Period). 6.1. The Winner will receive a Home Spring Clean complements of SC Johnson to the approximate total value of R 1 272.00 (one thousand two hundred and seventy-two rand) (Prize). 6.2. The Prize includes a Home Cleaning Company performing cleaning services for up to 4 (four) hours on 1 (one) day at the Winner's residence compliments of SC Johnson. 6.3. The Prize excludes all items not mentioned in clause 6.2. 6.4. The Prize will be subject to the standard terms and conditions for such services as promulgated by the third party service provider in connection with the Prize. 6.5. The Prize may only be redeemed for a residential property situated within the Republic of South Africa. 6.6. We will contact the Winner per telephone to make arrangements for delivery of the Prize. 6.7. The Prize must be redeemed by 23 December 2016, failing which the Prize may be forfeited at our sole discretion.